Curious about modern and contemporary art, the fundamentals of design, or what makes certain pieces better, or more beautiful, than others? Contemporary art and design rely on specific concepts and particular visual languages to impart ideas, express emotions, and convey meaning to their audiences. If you aren’t familiar with the foundational elements of art and design, it can be tricky to try and understand (much less discuss!) complicated or nuanced work. If you’re interested in learning more about art, design and how to talk about them, we’ve rounded up a few classes taught by experts in the field to help you get started. These classes will give you a grounding in art history and criticism, teach you the concepts that undergird much of contemporary art and design, and empower you to approach even the toughest, most inaccessible work and discuss it with confidence. Everyone can understand, appreciate, and develop their own opinions about contemporary art, they just have to learn a few fundamentals first. This 30-minute “Art 101” class with Artsy’s Jordana Zeldin gives you a straightforward lesson in how to define, discuss and find contemporary art and why it’s important. You’ll learn what to look for when you approach visual art, film, dance, sculpture or any other medium and what kind of questions to ask to help you understand, engage with, and appreciate what’s in front of you. You might know that something is beautiful when you see it, but have you ever considered why certain works are more beautiful than others? What is beauty, really, and how do artists create it? Cooper Hewitt Smithsonian Design Museum’s Ellen Lupton and Andrea Lipps take you on a curated tour inspired by their exhibition Beauty—Cooper Hewitt Design Triennial, exploring visual examples and giving you greater insight into the concept of beauty and how its incorporated into art, design, and the world around you. Mirko Ilić is a world-renowned artist and designer who draws on his own background as a child in war-torn Bosnia to create art that speaks truth to power and drive social change. In his class on design, he dives deep into what he believes is the fundamental role of the artist in the world, exploring how, when and why specific pieces of art can make a social impact, and how you can incorporate political or cultural advocacy into your own work. Great posters don’t just happen by accident. Artists and designers make specific choices about color, composition, balance, tension, and other elements to dazzle the eye and tell a compelling story. Cooper Hewitt Smithsonian Design Museum’s Ellen Lupton takes you on a tour of the museum’s collection of more than 4,000 posters, cherry-picking some of the most important and interesting examples and explaining the reasons behind their particular strength. If all that you’ve learned about art and design has inspired you to start creating your own interesting visual work, great! 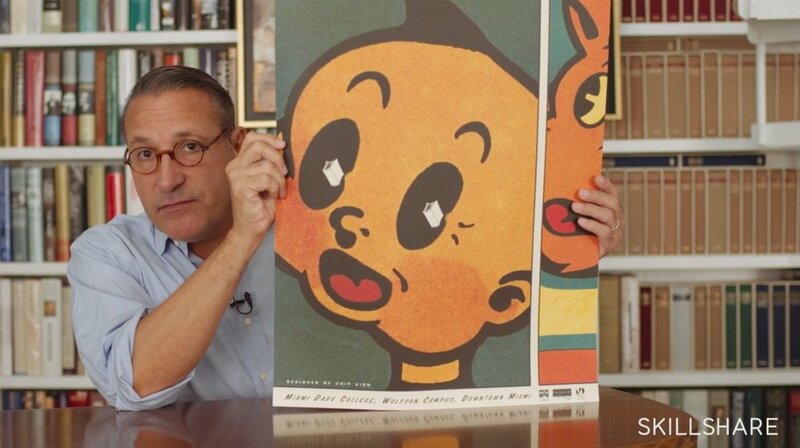 In his short, 35-minute class, Artist Chip Kidd takes you some of his own iconic design work to highlight how he thinks about art posters and how you can bring your ideas to life. Follow his method for brainstorming, researching, and executing his gorgeous art poster designs and you’ll be creating your own in no time! Want more? Skillshare has thousands of creative, tech, and business classes to help you go wherever your curiosity takes you. Start your journey at www.skillshare.com.